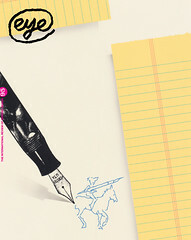 Graphic design plays a part in almost every area of our daily lives. But can it actually save your life? 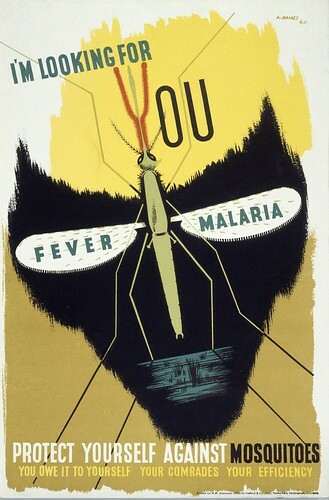 Lucienne Roberts’ and Rebecca Wright’s exhibition at the Wellcome Collection on London’s Euston Road dangles this provocative question as bait to lure the visitor into an exploration of the complex relationship between graphic design and health. The exhibition brings together a broad and fascinating range of graphic artefacts, carefully gathered and curated to present a narrative on graphic design and health from six different angles. 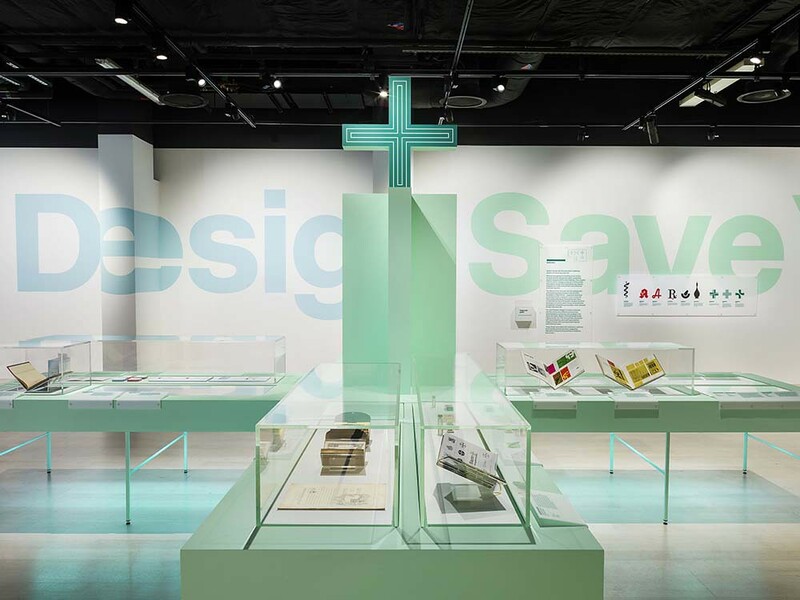 With the colourful and accessible graphic simplicity typical of Roberts’ design work, each section of the exhibition is represented by an icon: a cigarette for ‘Persuasion’; a question mark for ‘Education’; an ‘H’ for ‘Hospitalisation’; the green pharmacy cross for ‘Medication’; a warning triangle for ‘Contagion’; and an exclamation mark for ‘Provocation’. Rendered three-dimensionally, these icons form the physical structure and staging of the exhibition. As an exhibition design concept this has varying degrees of success. In the centre of the space, the ‘H’ for ‘Hospitalisation’ is strikingly constructed from the railing system and blue disposable concertina curtain material so iconic of the clinical hospital environment. Elsewhere, it is difficult for a giant cigarette icon or exclamation mark to not just look like a table. The variety of content included in the exhibition is wide-ranging. All the most well known canonical examples are here: Florence Nightingale’s early infographics (1858) making the case for basic standards of hygiene in military hospitals; the 1987 AIDS: don’t die of ignorance gravestone campaign (including one of the carved gravestone props used in the original photography); PearsonLloyd’s 2012 information system designed to reduce aggression in A&E departments. However it’s the less expected discoveries that are the most interesting, as is often the case. The kaleidoscopically animated LED pharmacy sign, which beckons visitors into the exhibition, is a brilliant example of the power of often-overlooked everyday design. How many of us have quickly identified a pharmacy in a foreign city because of one of these gloriously tasteless dancing green kaleidoscopic marvels? If I was to pick one life-saver from the exhibition, this would be it. Other gems include Yin Yao’s 2012 student project exploring the graphical representation of pain, the brilliantly funny and non-judgemental Japanese smoking etiquette guidelines commissioned by Japan Tobacco (Okakin 2008), and Marie Neurath’s sketches and handwritten letters from 1955, revealing fascinating insights into the design process behind an Isotype informational pamphlet explaining a Nigerian leprosy patient’s treatment journey. While the first five themes of the exhibition each presents clear narratives relating to their respective topics, the final section ‘Provocation’ attempts to present both examples of design which use provocation as a communication strategy and projects that seek to address issues of health and wellbeing in broader societal contexts. This split focus risks the loss of the strong conceptual consistency which each of the five preceding sections demonstrate. Despite the conceptual fuzziness of this final section it is perhaps this area that offers the most interesting answers to the question posed by the exhibition title. What does it mean to save a life? Can graphic design’s communicative efforts be used to expand conceptions of health, wellbeing and what it means to truly be alive, beyond the narrow confines of a medical physiological perspective? Published to coincide with the exhibition and sharing its name, the fifth book in Roberts’ and Wright’s GraphicDesign& series is more than a straightforward exhibition catalogue. Rather, it offers a delightfully accessible complementary expansion, exploration and reflection on the theme and the issues raised. Each of the designs featured in the book is accompanied by short responses from a range of designers and other stakeholders to the question: ‘Can Graphic Design Save Your Life?’ Reading the book while reflecting upon the exhibition, these responses add a depth and dimension absent from the exhibition itself – the designer’s voice. It is in these insightful, nuanced, reflections that the truly provocative potential of design reveals itself. Does graphic design enrich, or impoverish, life? Can graphic design ‘save’ a life by giving value, finding purpose, expanding empathy? These are questions which the exhibition and book do not explicitly ask, but do go some way towards answering. Abram Games’ poster I’m Looking for You, 1941. Part of a series commissioned by Her Majesty’s War Office. Top: The displays for the ‘Medication’ portion of the exhibition. Installation photographs by Andrew Meredith for Universal Design Studio.